You’ll also begin receiving our Options Profits Daily newsletter – Monday through Friday. Which means you now have access to some of the most important options research on the planet. You’ll learn which options plays to make and why… how to generate a continual stream of income… as well as the most up-to-date options news available. And don’t worry, just like the report you just claimed, Options Profits Daily is completely free. Dear Reader, I’m about to drop a bombshell in the laps of active traders. By the end of this bulletin, you’ll know exactly how it’s possible to screw up 100% of your trades and still bank potential gains every month on your trading capital. Before I get to that, I need to tell you a few important things first. You need to hear this stuff before diving into the rest of the bulletin. It’ll make a huge difference in your ability to use what you discover here. I have a dirty little confession to spring on you. I’m kind of leery of admitting this. In fact, it’s a safe bet, what I’m about to say will make a lot of traders reading this message burn with fury. But it needs to be said. Obsessed with finding the next winner. Scared to death of the next down rally. Blindly picking stocks like a kid grabbing candy at the checkout counter. And then wondering why their account keeps dwindling instead of growing. So I hope you pay close attention. What I’m about to tell you could be the turning point in your trading career. It could be the ONE THING that determines your probability of success or failure from here on out. Which reminds me of true story that illustrates my point. Joe was a “gung-ho” active trader with six years of experience under his belt. He thought he’d seen it all. Felt invincible in his ability to find and profit from daily stock gyrations. Within a two week period, he watched in horror as 80% of his account vaporized before his eyes. He set himself up for the kill and didn’t even know it. What happened is typical of those with the day-trading mentality. See, Joe thought he had a grip on the market. A lucky streak over the course of a couple of months saw his account balloon by over 500%. Joe figured he’d load up on as many contracts as his account could bear. In desperation… and wrongly thinking this was just some kind of “fluke”… Joe liquidated half his current positions hoping to catch a break when the market rebounded. Over the next two days of light volume pullback his account kept shrinking. But Joe was hoping beyond all hope the market would rally again. Three days later the market started chugging along. Joe was relieved and eager to prove the market wasn’t going to make a “chump” out of him. He plowed in. Maxed out his margin. Biting his nails in the hope the market would blast off. Over the following two weeks the market chopped him to pieces. When the dust settled, Joe’s account was down 80%. Dejected, Joe swore never to trade again… while… at the same time… trying to figure out how to claw his way back. Although, I’ve changed the name, the story is true. And it plays out in one form or another every day the market is open. Which means, you can be wrong 100% of the time and still rake in consistent cash from the markets. And you can do it with supreme safety from conservative trades that turn into substantial on-going income from week to week and month to month. The first trading research service I started was while I was still a teenager barely out of high school. That was 15 long years ago. Not bad for a kid from Peru. My subscribers were about the returns they were seeing from my recommendations. But the risk was high. The answer almost sent me into shock. It felt like a bucket of ice water down my shirt on a smoldering hot day. After several years of studying various trading systems I developed a proprietary chart analyzing tool. I was pretty proud of myself. Thought this was the answer to actively trading with complete safety and success. The beauty behind this “tool” was its ability to tell me when to enter and exit trades. Which sounds fantastic on the surface! But again, I ran into the same problem. The risk! The risk was astronomical. Within a few short minutes, your gains could disappear… even if… you set up “proper” stop losses and stuck to a winning strategy. In any case, my success did not go unnoticed. My company, TradingTips.com. was named to the Inc. 500 list of the fastest-growing private companies. I’ve been featured on Barron’s, SmartMoney, Forbes, USA Today and Kiplinger’s. Someone even dubbed me the “Untutored Stock Market Prodigy.” That’s because I put my certified 157 point I.Q. to work and taught myself how to trade stocks. My parents almost had a heart attack. Because they were grooming me to become a champion chess player. I turned my back on chess (and the years of study and preparation) and became obsessed with the idea of picking winning stocks. I’ve done so successfully for over a decade and watched in awe as some of my subscribers did even better than me. I’ve also seen other “wanna-be” traders lose their entire lifesavings by following the ego-infused advice of T.V. talking heads, financial advisors and so-called trading gurus who couldn’t pick a winning stock to save their lives. After all, look at the conventional and flawed strategy to trading the markets. The odds are stacked against you to the hilt. In other words, you are likely to be dead wrong on your picks most of the time. As a result, you’re going to lose and lose big. Remember 95% of traders get creamed out of the market. But what if there was a way to make money in the stock market whether the price of the asset moves against your position, remains at a standstill or (if you’re really lucky) moves in your favor? And what if it made no difference whether or not you ever picked a trade that actually moved the way you thought it would? What if you could be 100% wrong on every trade and still profit potentially every month on your trading capital and do so with a winning chance of 80% to 90%? How would that scenario change things for you? Well, I’m here to tell you I discovered what I believe is the Ultimate Trading Strategy for risk-averse active traders who crave an ongoing income stream from the markets. Generate consistent weekly and monthly income. You can generate cash from trading up to 52 times a year. Produce profit whether you’re right or wrong on any trade. When applied properly, this strategy does not depend upon the price action moving in your favor. Even if it moves against your position, you can earn a positive return. Give you an 80% to 90% chance of winning. You get paid a premium from other traders UPFRONT upon entering a trade and thus are in the best possible position to realize a profit. In effect, you become a market maker instead of a street-level trader. Limit potential losses. Unlike actively trading stocks, ETF’s, futures or options, with this strategy your risk is limited to a bare minimum. Often less than $250 per trade based on the broker’s requirements. You get paid to enter the trade in the first place. As long as you manage your position properly risk is minimized. Capitalize on market volatility. Which is exactly what we want. A roller coaster market is perfect for income-seeking active traders. This strategy thrives on market swings. As the volatility index rises, you’re positioned to pocket more profits. Allow for small but predictable gains. You’re not trying to hit home runs here. You want singles and doubles. Which are much easier to nail. The beauty behind this strategy is its ability to bring in small ($800 or more on a $10,000 margin for example) gains in quick and consistent bursts. You can start with as little as $2,000 in your account and even less margin to get your feet wet. Requires very little time. Just a few minutes once a week is all it takes to enter your trades. No need to stare at computer screens allday. Or rack your brains figuring out chart patterns. Or gulp down fistfuls of antacids as the markets adjust. WHAT IS THIS “MAGICAL” TRADING STRATEGY I’M RAVING ABOUT? Let me assure you it’s not some bogus trading idea I pulled out of a hat. In fact, some of the world’s Elite Traders swear by this strategy. Including a 30-year Chicago Board Options Exchange (CBOE) trading floor veteran and Bloomberg TV personality who I’ve chosen to manage the strategy for my readers. Some of these top traders use this strategy exclusively as the only market technique for their own account. $3,375.50 on LinkedIn in 14 days! $2,935.50 on Google in 30 days! $2,230.00 on NetFlix in 18 days! $1,765.00 on Russell 2000 iShares in 21 days! Not bad considering most people don’t earn that kind of “dough” slaving away 40 to 60 hours a week at a job. Cursing every last minute they’re stuck in traffic. Consumed by the “rat race” day in and day out. I’ll show you how I structured three of these trades a little later. It’s fascinating how simple and lucrative this is when you know what you’re doing. Before you dismiss this as a risky way to leverage off of stocks hear me out. Because I’m not talking about BUYING options and hoping they won’t expire worthless. This is a whole other ball game. So lend me your ear for a few minutes and you’ll discover one of the most exciting ways to put cash in your pocket every week and every month as a trader. First of all, I’ll explain why weekly options are different, better, more profitable and safer than regular options trading. Then I’ll reveal the “magic” of the credit spread trading strategy (it’s a lot more simple than it sounds) and how it turns weekly options into an income stream that plows potential gains into your trading account without the usual hassles and hazards of stocks, ETF’s, commodities, options or any other trading instrument. In October of 2005 the Chicago Board Options Exchange (CBOE) – the largest U.S. options market – introduced weekly options. As opposed to regular options that can expire months or years into the future, Weeklies have a shelf life of 8 days. Every week on Thursday, new weekly options are created for more than 325 securities. These include equities, ETF’s and equity indices. They expire 8 days later on Friday. So why are Weekly Options different, better, more profitable and safer than regular options? I think it’s critical that you understand the differences between the two. Otherwise, your misconceptions about options in general may force you to miss out on a huge opportunity. I agree with anyone who says options are inherently risky. Due to the massive leverage that can work for or against you, trading regular options is a gambler’s game. In fact, that’s one of the problems with options. Misguided traders use them to try and hit “home runs” without relying on a well thought out and planned trading strategy. I’m not going to go into a full-blown explanation about how options work. Instead I am going to show you why regular options trading is stacked against retail traders. In reality, your odds of failure at trading options is 80% to 90% against you. I mean, would you go to a regular job where you knew you’d lose money 80%+ of the time? Of course not. That’s crazy. Yet that’s what retail traders do every day when they put their money on the line with regular options. DISADVANTAGE #1: 80% of options expire worthless! According to the Chicago Mercantile Exchange, due to time decay, ALL options constantly lose value as they approach expiration. And, in fact, 8 out of 10 options never reach the intended strike price before expiring totally worthless. So the options buyer has an 80%+ chance of LOSING money on every trade. Not at smart way to go if you ask me. Pretend Mr. Options Gambler buys an out-of-the-money call option on ABC stock trading at $100 a share. He’s confident it’ll jolt up over the next 60 days. He’s guessing the underlying stock price will hover around $105 by then. For the sake of example, we’ll say the call option, with a strike price of $105 is trading at a premium of $2. One options contract is for 100 shares of underlying stock. Mr. Gambler is going to shell out $2 x 100 shares = $200 premium to buy this call option with a strike price of $105. Oh, and by the way, that’s excluding any broker commissions. So Mr. Gambler pays $200 for the right (but not the obligation) to buy 100 shares of ABC stock at the $105 strike price. He can exercise his option regardless of the price the underlying stock is trading at… until… the day the option expires. That’s 60 days out in this example. So Mr. Gambler is gambling on the underlying stock price moving above $105. If it does he makes a tidy little profit. The problem is this: As I’ve already said, according to the Chicago Mercantile Exchange, 80% of out-of-the-money options bought on a Call or Put basis expire before the strike price is reached. 80% or more of the time the underlying stock price does NOT move up (or down) enough… nor does it move fast enough… for the option to be worth a slim dime on expiration day. In this case, if the price of the underlying stock fails to rise to the option strike price of $105… then… the option expires worthless and Mr. Gambler just lost $200. Reason #1: The moment he bought the option he is in a LOSING position because he paid a premium to get into the trade. Reason #2: Time decay begins eroding the value of his position as soon as the trade is placed. And you lose the money (the premium) paid for the option 80% of the time or more. The odds of making money trading options this way are just too slim to make any sense. Who gets the money paid for the premium? DISADVANTAGE #2: Buying options is the worst position to be in! When a buyer purchases an option, the premium goes to the SELLER of the option. The buyer is immediately at a disadvantage because they are “out” the price of the option trade. The seller, on the other hand, is at an immediate ADVANTAGE because they get paid to enter the trade. This is a crucial point to understand. The market makers (the sellers) are the ones who end up with the buyer’s losses. And since buyers lose 80% of the time… that means… the sellers WIN 80% of the time. How exactly does this dynamic work… and… can a regular “Joe” trader put himself in the coveted “market maker” or seller position? The seller of the call option with the out-of-the-money strike price of $105 (from our earlier example) banked the $200 premium paid for by Mr. Options Gambler. The $200 premium is IMMEDIATELY credited to the seller’s account. He’s “in the black” the moment the trade is executed. The seller gets to keep the premium on the day the option expires if ABC stock is under $105. Which means the option expired worthless. Unlike the buyers, who lose their premium most of the time. Which side of the trade would you rather be on? For my money, I’d rather be the seller. But how… how is it possible to be the seller of options contracts rather than the doomed buyer? You can sell options in one of several ways. I won’t delve too deeply into the wrong ways of doing it… because… I’ll show you the best way to be a seller of options that produce income on a consistent basis safely. But, just to cover all bases, you can sell “naked” call and put options. This strategy, however, is insane because your downside risk is literally unlimited. So we’re not going to focus on that. You can also sell “covered” calls and puts. Much better. The risk is strictly limited. But you must own the underlying stocks in order to place these trades. You are therefore limited to how much you make based on which underlying stocks you own and how many fill your portfolio. The best strategy is to sell credit spreads on weekly options. I’ve already told you what a weekly option is. So what’s a credit spread? You hold BOTH a short position at a specific strike price… AND… a long position at a strike price even further away from the underlying asset’s price. BENEFIT #1: When you sell an out-of-the-money option credit spread you are in a good position to profit. One of the reasons is because the premium the buyer is paying consists of 100% depreciating time value. Time marches on against the buyer and in your favor as the seller. BENEFIT #2: 80% of options expire worthless so you have an 80% chance of making a profit. This is so important to understand. Options buyers are wringing their hands praying the option does not expire worthless. But in 80% of the cases it will. You, on the other hand as the seller, can’t wait for the option to expire worthless so you can keep the premium already credited to your account. BENEFIT #3: You can choose the probability of success on each and every trade. This is huge. Again, I won’t go into too much detail here. However, by choosing the delta on a particular part of your credit spread trade, you can approximate with mathematical precision the probability of an option being in-the-money at expiration BEFORE you place the trade. BENEFIT #4: You can be totally wrong on your assumptions and still profit. I’ll give you three examples of how this works. It’s unlike anything you can do with any other trading strategy. Imagine getting 100% of your trades wrong and still walking out with a positive return. BENEFIT #5: This is a conservative active trading strategy that can produce substantial profits. In other words, your downside is truly limited. And while your upside is somewhat limited also, the odds of one winner after another rolling in are stacked in your favor. I’ll explain the limited risk nature of credit spreads a little later on. The reason it’s called a credit spread is because your account is credited the minute your order is filled. That credit is the premium the options buyer pays you for the privilege of securing the option. Credit spreads safely allow you to sell a call or put option because you hedge the risk with a long position. The option you buy protects and secures your short position and reduces margin requirement. The short position is what allows you to generate cash from the trade. No option is bought outside of the security “blanket” provided by the credit spread set up. I think that gives you a thorough overview of what I consider the most amazing strategy for risk-averse active traders who crave cash from the markets on a consistent basis… without… all the needless and avoidable risk. I’ll cover a few more things you need to know in a moment. Right now, I want to go back to a point I made earlier in this presentation. The answer is now obvious to me. Pick up any book on the subject and the main goal of the book or course or whatever is to uncover stocks poised to go up in value and buy them before they take off. This is, for the most part, a losing game as statistics show. The idea behind almost all of the trading strategies out there is to BUY a stock, ETF, index or option bound to go up in price. You keep the difference between the price you bought the asset at and the price you sold it for when exiting the trade. The major reason this strategy doesn’t work for most is… TIMING. It’s not that difficult to find stocks about to jump up in value even on a short term basis. But the timing is where just about everyone screws up. If you don’t time the entry and exit just right you stand to lose a fortune. Regular traders don’t have the technology or other resources to pick stocks and time their trades with any positive certainty. With traditional stock and options trading, you have to be right or your toast. With credit spreads, you can literally be 100% wrong on all your trades and still laugh all the way to the bank. Because with credit spreads on weekly options, you don’t have to choose a direction on the underlying asset. You can potentially profit if the underlying stock price goes down. You can potentially profit if the underlying stock price rises up to a certain point. You can potentially profit if the underlying stock snakes sideways. And listen, just so you don’t think I’m blowing smoke here, you can lose money trading credit spreads. As I mentioned several times, 80% of options expire worthless. But around 20% don’t. So you do have somewhere around a 20% chance of losing. The great thing is I know a way to reduce that to under 10%. The point is it’s possible to have a credit spread trade go against you… if… you don’t pick the right underlying asset and you don’t manage your position properly. That’s a topic for the second part of this bulletin. I believe most traders are either too inexperienced to trade profitably or too addicted to the gambling rush to make any real money. Because they don’t know how to trade with maximum protection and hedging from the risk involved in active trading. And they use a strategy doomed to fail. I’ll explain how this strategy works… and… the easiest “hands-off” way to trade credit spreads on weekly options without having to learn anything. So you can get your feet wet without any trial and error mistakes… make some money before committing to this strategy… and then decide if it’s for you. Okay. So far, I shared with you what I believe is the best strategy for conservative, risk-averse traders who want consistent income on a weekly and monthly basis from the stock market. That strategy is… trading weekly options using credit spreads. Becoming the SELLER of options instead of the buyer. This way every time you enter a trade you are paid a premium upfront by the buyer. So you’re in the black right from the start. Taking advantage of time decay. Since 80% or more of options contracts expire worthless it makes sense for you to secure a position where you make a profit on those worthless expired options. Using credit spreads is what puts you in that coveted position. Using credit spreads to hedge your trades. So you can make a profit on a trade moving down against your assumptions… moving up against your assumptions… or sitting virtually still. With those points in mind, let me tell you how the Netflix, LinkedIn and Russell 2000 iShares weekly options credit spread trades played out. I was watching Netflix like a hawk for some time. Noticed it was trending up and figured the price would continue motoring on in the same upward trajectory. On March 31, 2014 Netflix traded at $350. 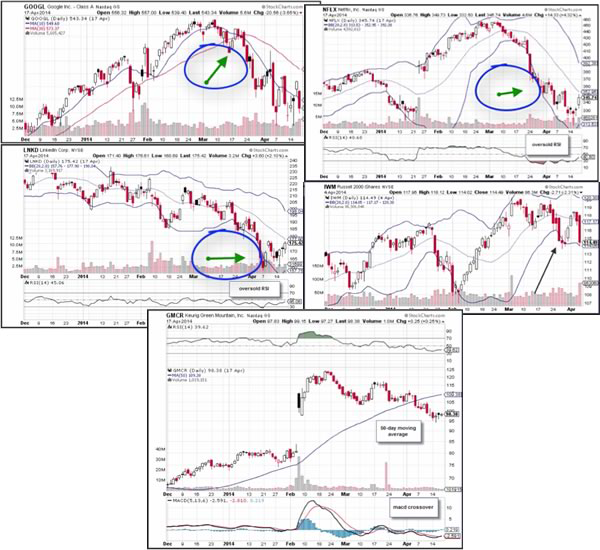 A few of my stock picking indicators told me things were dicey. Maybe Netflix would go up. I wasn’t 100% sure. Russell 2000 iShares (IWM) was trading around $114. But IWM presented a real problem. Despite owning some powerful trading technology, I couldn’t pinpoint where this stock was headed. I mean, it was almost a total mystery. Rather than trying to guess which way the price of the underlying stock was headed I decided to hedge my bets with a bullish put credit spread on March 28, 2014. I’m sure glad I did too. The other trade I want to tell you about is LinkedIn. The stock price was in a downward slump so I figured it would keep sliding. But again that was just my assumption and I wasn’t ready to bet the farm on it. On April 4, 2014 I entered this trade with a bullish put spread. The stock was around $165 and looking like it would dip further down. Had I plunked down my money on the underlying stock… instead of the option using a credit spread… my losses would have mounted up to a small fortune. And that’s just one of the “creative” ways traders lose. The best indicators, charts, technical analysis tools and trading experience in the world don’t always pay off. Again, I thought the price was sure to keep plugging along in an upward trend. But I was dead wrong. Netflix actually dipped down from $350 on March 31 to $312 a few days later. Had I traded the stock, I would of lost $38 on each share… plus… broker commissions. Of course, placing the correct stop losses may have helped to mitigate any losses. If you trade the underlying stock… and the price goes the opposite way… you’re gonna usually lose something. Sometimes that “something” is a lot. So instead of trading the underlying stock I decided to enter the Netflix trade as a bullish put spread. Which means, I had the right to sell a fixed number of shares under an options contract. And it also means I was banking on the underlying stock price to keep rising. Again, I was still wrong about the underlying stock going up… but… the spread position helped me make a tidy sum regardless. 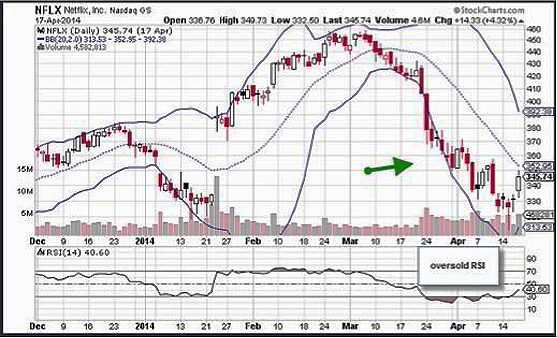 NFLX was trading at $350 on March 31, 2014. I felt it was almost impossible for the stock to tumble down as low as $300 a share during the remaining 2-1/2 weeks before the option expired worthless. The difference between the Put Option for the Strike Price of $300 and the next lower Strike Price was a credit to my account of $0.45. Since one options contract equals 100 shares of underlying stock I would receive a credit of $45 on each option upfront upon entering the trade. This is the premium I get to keep if and when the option expires worthless. By the expiration date of April 18, 2014 NFLX fell to $345. Despite the price moving against me, the trade expired worthless because the price did not reach the higher strike put at $300 by the expiration date. (50 * 100 * 0.45) – ($12.50 + 50 * 0.15) = $2,250 – $20.00 = $2,230.00! First, the probability of NFLX dropping from $350 to $300 (a 14% dip) in less than three weeks was low. You could tell just by looking over both technical and fundamental analytics regarding the market at large and NFLX in particular. Second, what made it even more likely that I’d turn some kind of profit is I calculated the delta on this trade prior to entry. I’ll tell you more about that later on. Finally, using intelligent trade management techniques, I already knew when I’d get out if the price action was too close to putting me in a losing position. I couldn’t make heads or tails of this trade at first. Rather than take a costly chance trading the stock, I entered a bullish put credit spread on March 28, 2014. The stock was going for $114. Based on my research, I figured this option would expire worthless above $110. In other words, I was pretty sure IWM was not going to fall from $114 to $110 between March 28 and the option expiration date of April 4, 2014. Notice the underlying stocks I’m trading weekly options on with a credit spread are offered by established companies. Netflix, Russell 2000 iShares, LinkedIn, Google, etc. The likelihood of their shares falling by any significant amount over a week or a couple of weeks is remote. Very remote. IWM would have had to drop by 3.7% in a week for me to lose money on it. And if it was a possibility, I’d trade it differently anyway. The difference between the Put Option for the Strike Price of $110 and the next lower Strike Price was a credit to my account of $0.12. By the expiration date of April 4, the trade expired worthless because the price of IWM was well above the $110 put that I sold. (150 * 100 * 0.12) – ($12.50 + 150 * 0.15) = $1,800 – $35 = $1,765.00! I thought it was going one way and it went in the exact opposite direction. My analysis indicated LNKD was down-trending. 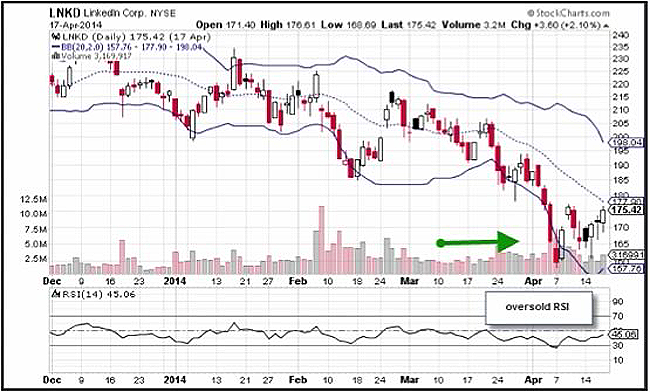 I used a bullish put spread to enter this trade also on April 4, 2014. LNKD was priced at $165. In this case, the difference between the Put Option for the Strike Price of $150 and the next lower Strike Price was a credit to my account of $0.43. That’s the premium the buyer of the option paid me. And that premium was credited to my account immediately upon entering the trade. On the expiration date of April 18, 2014 the trade expired worthless. The price of LNKD was above the $150 put that I sold on the date of expiration. (80 * 100 * 0.43) – ($12.50 + 80 * 0.15) = $3,400 – $24.50 = $3,375.50! These three trades plus two others (Google and Keurig Green Mountain) closed within a 30 day window. All in all, I made $13, 241.50 in 30 days after broker commissions. Not a bad month if you ask me. Not a bad month at all. During each of these trades I never worried about my account getting wiped out. I wasn’t sweating bullets, taking Tums by the fistfuls or stocking my fridge with Pepto-Bismol. Let me quickly introduce you to an options trading concept… which… allows you to determine the probability of a particular option expiring in-the-money. Which, of course, is not what you want as SELLERS of these options contracts. You want the options to expire worthless so you can keep the premium you collected immediately upon entering the trade. By calculating the probability of an option expiring in-the-money BEFORE entering a trade you know which options contracts you should sell and which ones to stay away from. This concept is a derivative of the Black-Scholes Option Pricing Equation. Richard C. Merton and Myron Scholes won the 1997 Nobel Prize In Economics for their explanation of this pricing model. The way you make money is by selling options to speculators… or… if you prefer… gamblers. When it comes to options, a gambler is a “trader” who buys a call or put option with a delta of .35 and below. “Delta” refers to the probability of an option expiring in-the-money. The likelihood of this happening can be determined prior to entering a trade. For instance, if an option has a delta of .35 you as the SELLER have a 65% chance of making money. Why? Because an option with a delta of .35 has a 65% chance of expiring worthless… and… only a 35% chance of expiring in-the-money. If you sell an option with a delta of .10 you as the SELLER have a 90% chance of making money. Because an option with a delta of .10 has a 90% chance of expiring worthless… which… is exactly what every options seller wants to happen. How do you figure out the delta? The delta values for different credit spread strike prices are listed in the options chain tables provided by various brokers who deal in options. Now look, I’m going to stop right here before things get too technical. What you simply need to understand is that you can use “delta hedging” to know upfront which options to sell and which ones to steer clear of. Just this single piece of information puts us in a safer trade with a higher than usual chance of turning into cash. Even before you calculate the delta you must know how to avoid having one of these trades blow up in your face. these trades blow up in your face. Unfortunately, there is no trading strategy that is 100% successful. Even though, trading weekly options with credit spreads is safer, more secure and a highly probable way of generating income from the market… you can still lose money… if… you don’t know what you’re doing. Liquidity: Any stock with low volume and open interest is automatically disqualified. I use a specific set of standards to determine these criteria. Volatility: Low beta stocks are never considered for trading using credit spreads. They simply won’t generate the premiums I’m looking for in a trade of this kind. Earnings Reports: A stock whose company issues an earnings report prior to expiration is a terrible pick. The report could cause a quick upturn or downturn and push our position beyond where we can stop the trade out. Those are the obvious criteria. Correct distance between the two legs of the credit spread. How much net premium is enough for a trade to make sense. The distance between the strike prices of the trade. How to tweak a trade if it’s going in the wrong direction. Where to place a stop so you mitigate any losses. Managing the money in your account. Which brokers are best for placing these kinds of trades. I personally rely on a credit spread trading checklist. If a potential play does not meet the minimum criteria based on my checklist, then I don’t enter that trade. Keeps things simple, safe and consistently profitable. It’s time to find out how you can take advantage of them yourself. So you can trade weekly options using credit spreads for safe and predictable returns you can bank on. This strategy will work for anyone. Whether you’ve been trading for years… or you’re just dipping your toe in the markets… this strategy is a safer and more reliable way to profit from weekly options than anything else I can think of. Before we get to that, I’d like to answer some of the most frequently asked questions about trading weekly options using credit spreads. I’ll clear the air about a few “snags” some people seem to get caught on. “This sounds good but I heard weekly options are risky. Because any trading instrument you use has some risk tied to it. And I made no bones about the fact that you can (and people do) lose money trading weekly options. I recently read about one trader who nailed 29 out of 30 successful trades over a three month period using weekly options. The average trade was plus $150. Then… in ONE SINGLE 45 minute trading period… (and in my opinion due to improperly setting up a system to bail out of a trade gone bad) they lost $3,500. Basically, it wiped out all the gains they boasted about over the past three months. Trading weekly options WITH credit spreads is what minimizes our risk. If you recall, I said you can be 100% wrong on your assumptions about how a stock is about to “behave”… and… still make a profit. SELLING options… instead of… buying them or the underlying asset. Relying on time-tested strategies to manage a trade once you enter it. With the right risk management strategies… even if a credit spread trade goes against your position… you can exit fast and cut your losses well before they become a real profit-drain on your account. I will recommend the options-friendly brokers who will not scalp you. They are uninformed and simply don’t know what they’re doing. They panic and allow fear to rule the trade instead of cold calculated strategy. They get greedy and let runaway avarice take them for a ride. Which quickly leads to losses. This is not a strategy for wild-eyed gamblers with money burning holes in their pockets. As I said from the get-go, this is for risk-averse traders who are sick and tired of losing… and… would like to earn consistent and predictable profits on their trading capital on a weekly and monthly basis. Besides, once you get going the profits can really run up. Remember, I made almost $3,400 on LinkedIn in two weeks… and… over $13,000 in 30 days making these kinds of “small” predictable trades with my own money. That’s well over six-figures a year in personal income from trading. How hard is it to open an account and get in on the action ? It’s easy. Just like opening up a regular account. Nothing to it but to contact the options-friendly brokers I’ll recommend and get set up. In most cases, you’ll need at least $2,000 to open an account. But the margin on each trade is often a fraction of that amount. You just might have the wrong idea. With this strategy, you can bat .800 or better. As the SELLER of the option, you make money when these out-of-the-money options expire. And you make your money by keeping the premium that the BUYER of the option paid to get into the trade. Since statistically (according to the Chicago Mercantile Exchange) 80% of options expire worthless… then… obviously… you have around an 80% chance of making a profit every time you enter one of these trades. So you can trade as many weekly options as you want… but… as I’ll tell you later on… you can also trade specific recommendations that my handpicked CBOE veteran will be issuing. And he’ll only offer a couple of those recommendations to readers per week. Over 800,000 weekly options contracts are traded daily according to the CBOE. What guarantee is there that I’ll make money trading weekly options ? What guarantee is there about anything in life? None. First, you can paper trade and get up to speed without risking one thin dime. Second, you’ll get alerts, trading blueprints, the knowledge, experience and strategies to safely, conservatively and consistently turn weekly options into an income stream. “Other trading systems I tried before never worked. Either the people behind the system don’t know what they’re doing themselves… or… the system is so complicated traders can’t make heads or tails of it and don’t use it properly. I’m not offering you a system. In fact, I’m not offering you anything you have to learn. NO learning curve because you don’t have to wade through any manuals or audios. NO charts or other technical mumbo-jumbo to figure out. NO need to go blind watching endless ticker symbols scroll across your TV or computer. NO need to fry your brains keeping track of dozens of plays per day. NONE of that. What I’ve got in store for you is much, much better. It’s a way for you to do pass off ALL of the hard work onto a seasoned options expert… one with 30 years of market experience… and still be able to potentially profit every week from this strategy. It’s called the Options Cash Cow Research Service. This is a true done-for-you trading research service. But before I tell you what you’ll receive from it, I want to introduce you to the man I’ve specifically selected as the Executive Editor of the service. 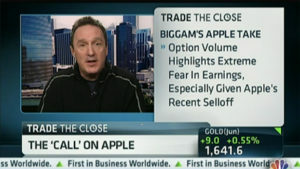 His name is Tim Biggam and he’s agreed to serve as Option Cash Cow’s chief Weekly Option analyst and trading expert. Tim’s spent over two decades in the options game and he’s one of the market’s most respected and experienced voices. As a member of the Chicago Board of Options Exchange (CBOE), Tim was a top options Market Maker for over 3 years during extremely volatile market conditions. For the next 20 years he worked for several successful private options and securities firms as their Chief Options Strategist before finally joining us at Tradingtips. He’s been featured by Reuters, Chicago Derivatives Desk, The Wall Street Journal Options Report, Barrons, TheStreet.com, Futures Industry, and Risk Magazine.. When I first saw Tim it was on one his weekly Bloomberg TV appearances. I was immediately intrigued by his seemingly endless knowledge and success trading with this conservative strategy. I began following his work personally and before long, I contacted him asking him to join forces in assisting Tradingtips readers with spotting and profiting from these weeklys. It took some convincing and good bit of negotiation but I’m thrilled he said yes! So how will Tim be assisting you inside Options Cash Cow? And how to manage each trade recommendation to maximize potential profits. Everything necessary to properly trade weekly options using credit spreads is done for you by a 30-year options “pro”. Your only “job” is to play or paper trade the alerts Tim sends… follow along as recommendations are tweaked and strengthened… and… plow the potential profits into your trading account. 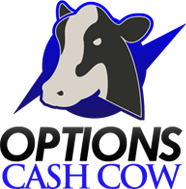 Options Cash Cow is (bar none) the easiest way to get started trading weekly options using credit spreads. The Wednesday “Cash Cow” Alerts. Every Wednesday Tim will deliver three trading opportunities directly to your email inbox. Two of those recommendations will be short term credit spreads on weekly options. One trade will be a longer term credit spread on monthly options. You also receive the Credit Spread Trading Blueprints. For each alert, Tim provides an explanation of why he chose it. Plus complete details of how the trade is structured. The Friday “Tweaks” And Recap. Tim sends you any changes to the long term positions… plus… a summary discussing the outcome of the prior week’s recommendations. The Credit Spreads 101 Video And Guide. We prepared these as a courtesy to you. After all, we have no idea what you know or don’t know about weekly options and credit spreads. The hour long video and summary guide gets you up to speed. It covers topics such as: A full description of credit spreads… The benefits of credit spreads… How to transact a credit spread trade via an online broker… The risk management behind a credit spread… How to trade weekly options… The benefits of weekly options… The volume and open interest on credit spreads and weekly options. And a few other important things you must know about. The days of wondering if you’ll ever bring in positive gains (without losing them to one bad trade) are gone forever. Because you can now apply the credit spread strategy to weekly options to bring in small but steady streams of cash from low risk, high probability trade recommendations. The best part for you is there’s nothing to learn or figure out. Simply follow Tim Biggam’s lead as he reveals the exact trades and trading strategy for each pick. If you’re totally new to trading or a bit unsure… no problem. Paper trade a few of his picks first. Get used to the process. After a couple of simulated trades you’ll get the hang of it. If you’ve been around the trading block… that’s fine too. Take Tim’s alerts and blueprints and model them for your own account. The benefit to you is obvious. You receive recommendations he’s carefully analyzed, scrutinized and vetted before sending them your way. You’ll see the proof week in and week out as his alerts become an income stream you can count on. Like I said before, Options Cash Cow is perfect for conservative, risk-averse traders who want to bank potential profits every month from the markets. In this case, you can do it without all the usual hassles, struggles and gut-wrenching failures 95% of active traders suffer. Once you get going Tim’s alerts could generate an almost automatic income stream. All it takes is a few minutes once a week to set up your trade. Then simply watch your inbox for any instructions to correct positions that start going south. That does happen from time to time. But you don’t have to worry. Tim watches these trades all day, every day for you. If he sees the need to change a position so you’re better protected against any losses… then… he’ll send you additional instructions to make those changes in your account quickly and easily. Managing each trade recommendation issued inside Options Cash Cow is Tim’s job, not yours. All you do is follow his simple directions to enter, manage and exit each recommendation with a positive gain every single week potentially. What I love about trading weekly options with credit spreads is that not only is it a low-risk strategy… but… just as cool… it requires almost no time on your part baby-sitting each trade you enter. A few minutes a day (about 15 minutes or so to be exact) is all you need to stay on top of the trades you enter. It’s simple. It’s fun. It’s very profitable. You could leverage Tim Biggam’s experience and alerts into dependable cash flow on a weekly and monthly basis. How can you put a value on that? I’m not sure… but… I’ve come up with a way to prove the total value of this service with zero risk on your part. I know the only way to prove (really prove) the value of Options Cash Cow is to have you try it for yourself first. That’s the only way to determine if it’s right for you or not. 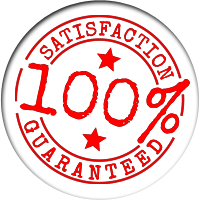 Therefore, what I’ll do is give you a FREE 30-Day Trial with complete access to everything including our support system. The only thing I ask you to pay for is the shipping and handling fee (just $7.67) to mail you the credit spreads 101 video and guide. During your FREE 30-Day Trial, you can either paper trade Tim’s alerts… or… use real money to put Options Cash Cow to the test. Either way, you’ll see the success of this research first hand. Just like I did when I used it inside my own personal portfolio! And you don’t have to believe a word I’m saying because you can prove it out for yourself. After the FREE 30-Day Trial your choices are pretty simple. Either you don’t like Options Cash Cow or you do. If not, just let us know (the support contact information is posted in the member’s area) and we’ll part friends. If you do like it then your credit card will be charged $197 for the first month. Each month you stay on board the same subscription fee applies for as long as you remain a member. Cancel any time for any reason. If you model Tim’s trades it is likely you will make multiples on your monthly subscription fee. Remember, I made over $13,000 in just one 30 day period. Unlike other alert services, I’m not asking you to plunk down thousands of dollars on a hope and a prayer. I’m a level-headed guy and know from experience your best bet is to try… just try… Tim Biggam’s Options Cash Cow first before you make a decision. There’s no risk on your part whatsoever. In fact, I’m taking all the risk. Because the kit I’m mailing you reveals some proprietary secrets to trading weekly options using credit spreads. Plus, Tim is taking the time to research and find the right plays. Then formulating the entry strategy… the trade management strategy… and the exit strategy for you. Even more, he’s watching each trade for you. All of this takes time, effort and both financial and human capital. You have the fun part. Join up and give Options Cash Cow a try. By the time the FREE 30-Day Trial is over (if you modeled Tim’s trades) you could see some juicy returns either on paper or in the form of cash in your trading account. Put my feet to the fire and try the Options Cash Cow alert service at my risk. Take full advantage of the FREE 30-Day Trial. Get Tim’s alerts and either paper trade them or trade them in your account. If after the trial period you don’t agree this is the best way for conservative risk-averse traders to plunder the markets… If you don’t think it’s worth many times the subscription fee… then just send me an email [email protected] and you’ll never be charged a thin dime. Your spot will go to another eager trader and we’ll call it a day. No harm. No foul. Fair enough? I believe something this good needs to be kept small. So I decided to limit the number of subscribers I’ll allow in. 1. This is a first-class alert service. Which means, I hired one of the best options analyst in the country to offer the best recommendations and support. The more people who join the more difficult it is to offer them the support needed. So keeping it small makes sense from a logistical point of view. That’s why I hope you don’t “hem and haw” and take your time about getting on board. Once we come close to capacity I might shut the doors early. 2. Tim makes recommendations on weekly options using credit spreads with some unique (and I dare say exclusive) techniques. You will be privy to some of these… but… he’s not interested in the whole world knowing about them. As a result, I need to keep the number of FREE 30-Day Trial subscribers to a bare minimum. In this case, speed is your friend. The FREE 30-Day Trial remains open at this time. I’ll keep it open until we get close to capacity. Throughout this bulletin I’ve been “straight” with you. No hype about making millions of dollars and retiring in a week if you join Options Cash Cow. No inflated promises with no proof. I’ve told it like it is. 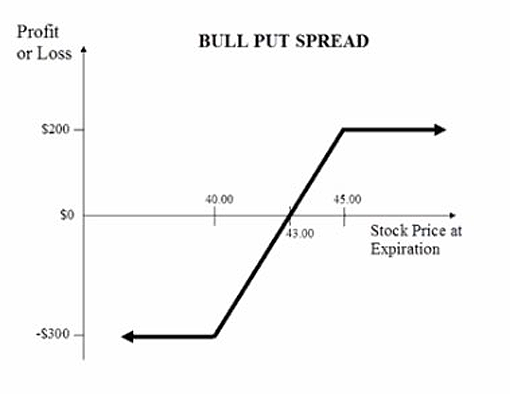 Trading weekly options using credit spreads is a safe and steady way to make money from trading. You won’t get filthy rich overnight. You might never get rich. This strategy is the antidote to getting hammered by the market. You can count on small and consistent profits. You minimize risk by being in the SELLING position instead of the buyer of options. You put the odds of success on your shoulders since 80% of out-of-the-money options contracts expire worthless. And you as the seller collect the premium a buyer paid you to enter the trade. You are, in fact, in the driver’s seat with about an 80% chance of winning every time. This is a real and proven way to make the markets pay you weekly and monthly. On top of all that, by joining Options Cash Cow on a FREE 30-Day Trial basis, you don’t have to become an expert on trading weekly options and credit spreads. Because the service (and Tim) do all the work for you. Model his trading strategy and enjoy a dependable income stream most traders pray for but will never see as long as they trade. © Optionsprofitsdaily.com. All Rights Reserved. Optionsprofitsdaily.com is a division of Wealthpire, Inc.